An Apple truck arrived Aug. 2 at Minot State University and carried away 27 pallets of e-waste. The e-waste consisted of unusable, university-owned electronic and computer equipment, previously deemed scrap and beyond repair. Last year, 15 pallets were loaded on an Apple truck and recycled. This is the third year that MSU has utilized Apple’s free-waste recycling program for educational institutions. 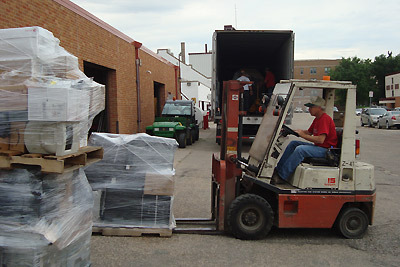 Minot State remains eco-friendly while disposing of scrap items at no cost to itself.